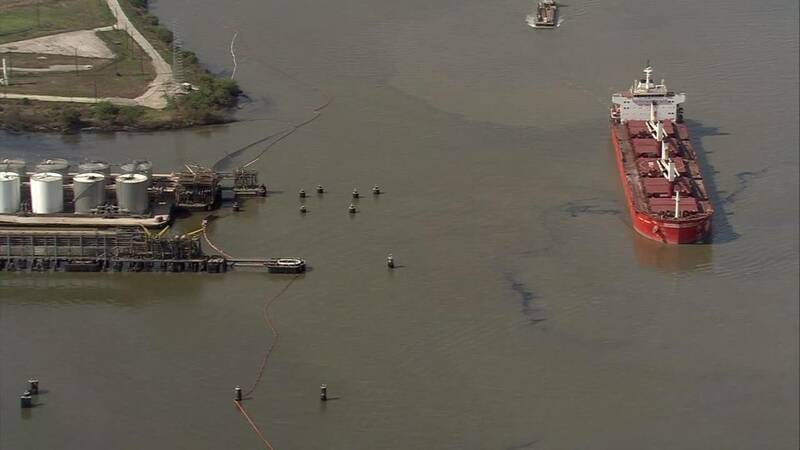 DEER PARK, Texas - Nine toxins were detected from water samples near the ITC Deer Park ditch after multiple chemicals from the facility leaked into the Houston Ship Channel after a dike wall collapsed Friday, according to the Texas Commission on Environmental Quality. The ship channel was closed as a result. Saturday marked six days since a fire broke out at the chemical storage facility, causing a large plume of black smoke to drift over the eastern parts of Harris County and out to the Austin and San Antonio areas. The cause of the fire remains under investigation, officials said. The news of the chemical leak came the day after the fire reignited at the facility and in a nearby drainage ditch. The cause of reignition is under investigation. Capt. Kevin Oditt with the U.S. Coast Guard said they deployed a total of 8,500 feet of boom, hoping to trap as much of the chemical waste that entered the water as possible. Despite these efforts, however, some of the waste did make it to the ship channel's waters, and ports detected elevated levels of benzene in the water. Brent Weber, ITC Deer Park incident commander, said the material that leaked out of the dike wall contained benzene, Pygas, water and foam. Benzene is a colorless, flammable liquid with a sweet odor. It is also a known carcinogen that has been linked to leukemia and other blood cancers, according to the American Cancer Society. Pyrolysis gasoline, known in the industry as "Pygas," is a byproduct of a chemical process involving naphtha. RELATED: What's burning at the chemical plant in Deer Park? The foam was used to fight the chemical fire at ITC Deer Park. It was used to create a seal over the chemicals to block the fumes from escaping. During the battle against the blaze, the already deployed and contaminated foam was sitting on the floor of the chemical storage facility. That foam is what leaked out into the ditch, officials said. TCEQ collected water samples from the ITC ditch and found that the nine toxic substances exceeded their health-protective concentration level. “Nine constituents in the samples tested thus far exceeded their health-protective concentration level, including total xylenes, pyrene, anthracene, benzene, ethylbenzene, toluene, phenanthrene, fluoranthene, and 2-methylnaphthalene," according to TCEQ. Oditt said the ship channel will remain closed until further notice. Eight parks remained closed Saturday afternoon, Harris County Precinct 2 said.